Some people think that a Venn Diagram helps them see where their differences come together in a moment of succinct agreeableness. In reality, though, it merely shows groups that are defined by a series of attributes and how they’ve all decided what they can agree on. It doesn’t account for the ideas and experiences that lie outside or on the boundaries of those defined groups. Artist Sheila Pepe helps us see the value and authenticity of these ‘boundary dwellers’ in her exhibit Hot Mess Formalism, currently on view at the Bemis Center for Contemporary Arts. The exhibit varies in medium, genre and theory, but this disarray—as Pepe describes it—actually gives way to a new formalism that distinguishes new elements for our consideration. When you describe something or someone as a hot mess, it is done so with critical love, according to Pepe. It is an endearing reinforcement of what a mess you’ve become—in a good way. When attached to the rigid ideas of formalism, it upends the excessive adherence to prescribed forms and the idea that formats—no matter in what context—need to maintain a sort of code. We cling tightly to tradition and norms, but when we do it so much that we eliminate nuance and diversity it comes undone. What Pepe is showing us is about chaos—disrupting this code. In particular with feminism but also with the history of art as well. If, as art history’s version of formalism tells us, we study art believing that everything necessary to comprehending the work of art is contained within the work of art, we don’t get too far beyond composition, light, color, line, etc. How do you describe a shoelace as a formal element and fit it into a tidy category of art history? Pepe isn’t just creating categories—because categories are still constrictive—she is allowing us to describe things as we see them and as we experience them. Something we can’t describe because we haven’t been given the words for it is welcomed and the suggestion that new words and descriptors are valid is encouraged. Pepe works in a variety of mediums, many of them that would be considered part of traditional women’s art—ceramics, fiber. Women’s art tended to center around creating beautiful things that were also useful—weaving baskets, clothing, tapestries, vessels. They served a purpose in some way. Women and their work have always been their constructive offering to the world whether they are creating art or building communities, yet they are often relegated to the background. In Pepe’s work it is up front. The craft, the woman who made it and the way we interact with both is the key element—the lynchpin that makes the world function. 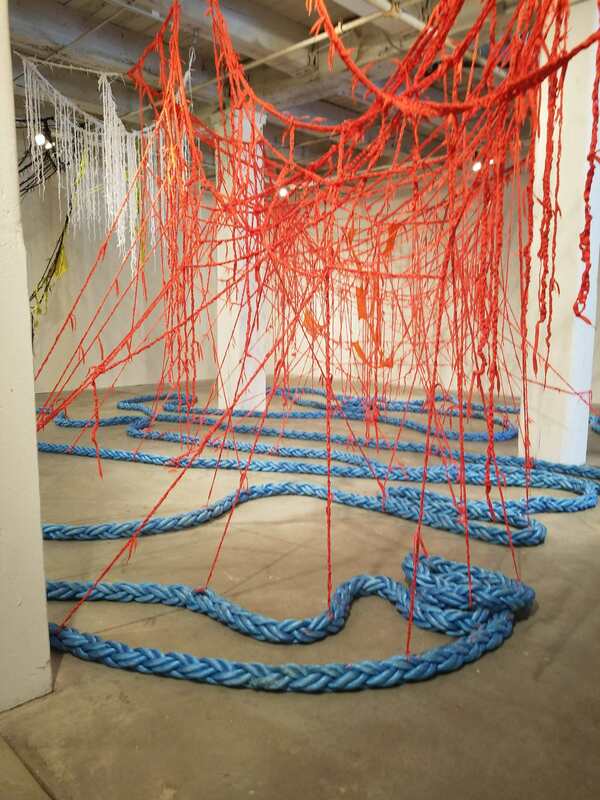 “Red Hook at Bedford Terrace”, along her other fiber installations, highlight an interesting symbolism of this history of women’s art. The expectation for women was that their work must be tidy, controlled, purposeful, unemotional—ladylike? But here it spreads out, takes up space. The Installation is tight in some areas, loose in others. There are portions that sag, some that are wrapped up and constrained. Some float and are tangled together with resistant knots. A hot mess of mixed materials that are all resourceful, puzzling and stunning at the same time. “Women are Bricks” pulls in the hard-edged materials of trade—men’s work, if you will. 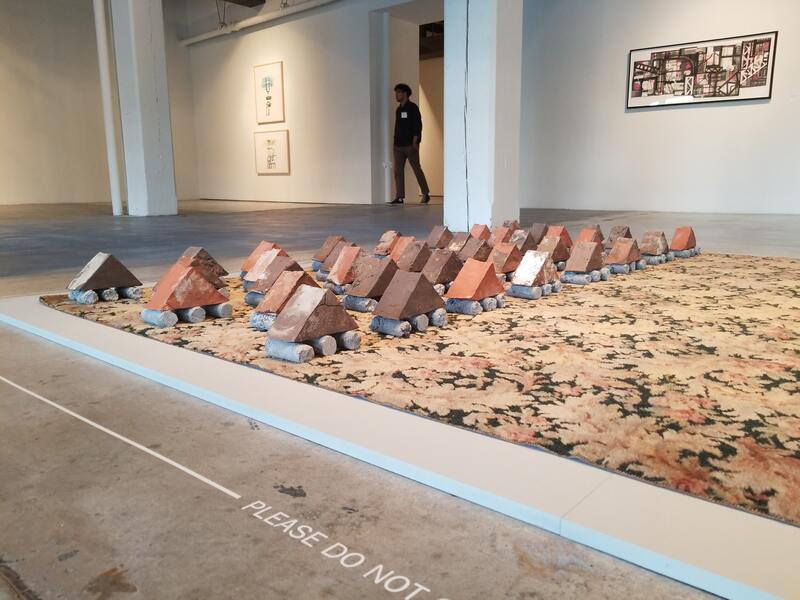 The tank-like structures made of brick and cement spread across a large floral rug. An army that doesn’t have time for what they are expected to be and do. They have work to do. They are building communities, fighting injustice, managing homes and educating generations. They don’t have time for lectures about formalism and grand speeches when there is a to-do list to complete. They keep moving forward, using their traditional roles as a foundation and building on their experience. Pepe’s ceramics dwell in these boundaries as well. She combines the decorative art with industrial materials like coils, wires and other useful things. Together they give an illusion that they might do something more that look pretty but the objects are not given a purpose. And, according to Pepe, that’s ok. She says that “art exists for no reason but the one you can’t explain.” This idea comes through in so much of her work and amplifies the notion of boundary dwellers. Like the crisscross of medium and genre in this thirty-year retrospective, people don’t live in binary terms. The differences they have become their definition. The new formalism is the way that characteristics, flaws, opinions, and preferences that diverge from tradition are now the components we look for to help shape our comprehension. We can look at outdated norms and classifications with critical love and recognize them for the hot messes they are. Then we can pull from that hot mess some new benchmarks that make use more avid learners, observers, and collaborators. Hot Mess Formalismis on view at Bemis Center for Contemporary Arts, 724 S. 12thStreet, through September 15. For more information, visit bemiscenter.org or sheilapepe.com.